The Prince Lionheart balance bike is made from 100% birch plywood, which gives the benefit of being good for the environment as well as being lightweight and strong. This bike is aimed at the core market of 2-5 years olds, and weighs in at a competitive 4.5kg. It has a stylish and sporty design, with the makers name brandished down the side of the bike and the racing number 73 on the front, which kids will love. The wide 12” rubber tyres have a spoked design which enhances the appearance of the bike, and comfort is provided with rubber hand grips and the padded seat. Making sure you select a bike with the correct saddle height is one of the most important aspects of choosing the best balance bike for your child. The seat on the Prince Lionheart balance bike can be adjusted to 3 different heights between 37cm and 43cm, so this bike is included in our recommended balance bikes for 3 year olds. You can read more in our balance bike saddle height guide, and if you are looking for a bike for a 2 year old you can also check our guide to this age range. 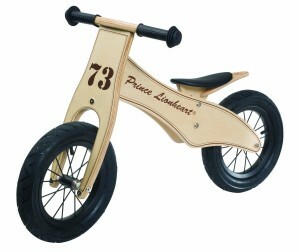 The Prince Lionheart Balance bike is a good quality wooden bike that won’t let you down, and gets very favourable reviews. An alternative wooden balance bike in this category is the Jiggy Wooden balance bike, and there are plenty of options of metal bikes including Bike Star, Strider and Puky.